More than 140 major global public cloud services providers have started businesses in the city, including Amazon's cloud computing services Amazon Web Services (AWS), Mcc Meili Cloud Computing Industry Investment Co as well as Qihoo 360 Technology Co, the Xinhua News Agency reported in November 2018. Zhongwei has several advantages: low electricity costs, fast internet and low temperatures, all of which are essential for cloud computing technology. By the end of 2019, about 488 projects will be implemented in the city with a total investment of 21 billion yuan ($3.13 billion), including infrastructure construction, ecological environmental protection and industrial transformation and upgrading, Chinanews reported in March. The previously barren city, located on the southern border of the Tengger Desert, is now striving to become the "Phoenix of the Orient." 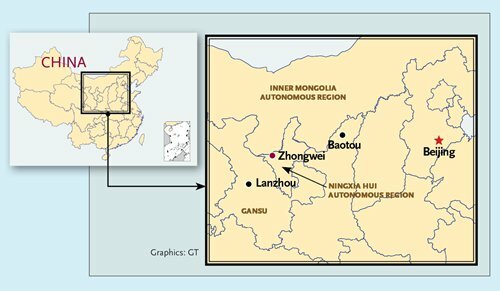 Sitting at the intersection of Ningxia, North China's Inner Mongolia Autonomous Region and Northwest China's Gansu Province, Zhongwei has a harsh environment that has held it back from achieving major economic growth. Zhongwei is about 1,068 square kilometers in area, and is frequently battered by sand storms. There is a saying about the local geographical conditions: "There are no birds in the sky but stones follow the wind all the time." The city became famous for using straw "checkerboards" to prevent desert encroachment six decades ago when the Baotou-Lanzhou Railway, China's first desert railway, passed through Tengger near Shapotou in the city. It was also awarded the Global 500 Roll of Honor for Environmental Achievement by the United Nations in 1994. The improved ecological environment gave companies more of an incentive to think about setting up business in Zhongwei. Li Bin, deputy head of the Department of Zhongwei Cloud Computing and Big Data Development and Service, claims Zhongwei has advantages over other "cloud computing cities" in China, such as Guizhou, Zhangjiakou and Hohhot, China Economics Times reported. Zhongwei has an average temperature of around 8.8 C, which is ideal for dissipating heat from servers. The average power usage effectiveness (PUE) of Zhongwei (1.1) is much lower than the average rate of other data centers in China (2.5), allowing it to use less than half the energy. "If the PUE of all domestic data centers could be reduced to 1.1, approximately 60 billion kilowatt-hour of electricity could be saved - equal to 60 percent of the generating capacity of The Three Gorges units," Li told China Newsweek. He also noted the current network latency from Zhongwei to Beijing is less than 10 milliseconds, with the average price at 0.36 yuan, and less than 5 milliseconds to big cities in western China, which means Zhongwei could serve as the "data suburbs" for these big cities, China Economics Times reported. In fact, half of the costs of cloud computing comes from electricity. As a result, companies that invest in cloud computing in Zhongwei can enjoy the benefits of low investment costs, rapid construction, low operating costs as well as high-performance network conditions. In 2012, global cloud computing giant Amazon entered the Chinese market and began searching for a location for its data center. Zhongwei decided to compete for the opportunity. "Zhongwei's goal is to become the next Phoenix city," Wan Xinheng, then deputy mayor of Zhongwei, vowed in 2013, according to a China Newsweek report in December 2018. Wan was 41 at the time and had graduated in computing. "Zhongwei and Phoenix have similar desert environment and climate," he said. The city of Phoenix in Arizona, US, once poor and undeveloped, has risen in past decades through developing high-tech industries. Seeking to bring AWS to Zhongwei was a bold idea, Bai Yingqi, current deputy mayor of Zhongwei, told China Newsweek. But Zhongwei leaders realized the value in the effect Amazon would have. "Wherever it [Amazon] is located, other cloud computing companies would follow," Bai said. Before Zhongwei, Amazon in Asia had partnered with Beijing, Mumbai, Singapore and Tokyo, all world-famous metropolises. However, Amazon also cares about cost, and that was why Zhongwei was able to attract the giant's attention. Bai said that Amazon had looked at more than 130 places in China, and the main factors they considered were related to cost - land, tax, electricity and internet. Bai told China Newsweek that AWS was satisfied with Zhongwei in almost all aspects apart from Zhongwei's broadband facilities, which have to be of high quality in order to develop the cloud computing industry. To meet Amazon's needs, Zhongwei needed to build a fiber-optical backbone network, which requires an adjustment of the national backbone network. "It was very complicated. Money was not an issue, but government policy was key," Bai said told the China Newsweek. To achieve this goal, representatives from Ningxia regional government and the Zhongwei government visited Beijing 10 times, coordinating with the Ministry of Industry and Information Technology and China's three telecommunications operators in the hope of gaining support. After a year of efforts, the three giants agreed to open a network highway for Zhongwei, making it the city with the best network in China after Beijing and Shanghai. In December 2013, AWS and the Beijing government, Ningxia regional government and China Broadband Capital signed a framework agreement, announcing the construction of the Ningxia-Zhongguancun Science and Technology Industrial Park in Zhongwei. According to the agreement, AWS would invest $2.5 billion, install 400,000 servers, and employ 1,000 people, with a prospective profit of up to $1.5 billion. Three ultra-large data centers have been built and 70,000 servers are already in operation. After AWS settled in Zhongwei, many other companies involved in cloud computing also followed suit, including Germany's STULZ, China's Alibaba and JD, the China Newsweek reported. Meanwhile, Zhongwei served as a "back factory" for Beijing's Zhongguancun, China's computing capital. More than 90 percent of data is kept in Zhongwei's data center, instead of in big cities. This model has also raised the security level of data storage. He Jian, Party chief of Zhongwei, told China Newsweek that Zhongwei, a inland city in Northwest China, has found an innovative method of economic transition in six years and provided a development model for less-developed regions. According to the plan, Zhongwei's next goal is to become a model national-level big data center. The city plans to set up 1 million servers, bringing in annual profits of 40 billion yuan, making it the real "Phoenix of the Orient."